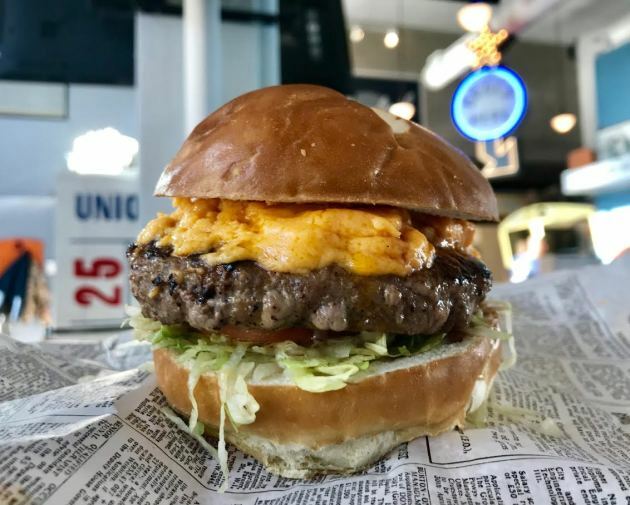 The burger: For those thinking that Brian Ingram nabbed the location for his Bus Stop Burgers & Brewhouse due to its proximity to U.S. Bank Stadium – the newcomer is located on the street level of one of two matching Wells Fargo office towers that front the Commons park, the football palace’s front yard – think again. Instead, the decision was based entirely upon hungry office workers. Ingram is focusing on fast-casual, limited-service models that he believes will weather the restaurant industry’s rising minimum-wage storm. For Bus Stop, he channeled his fascination with old Southern bus stations into a design schematic. 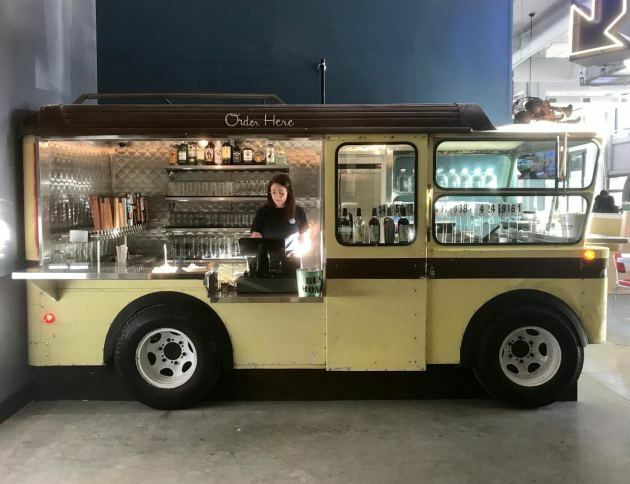 Working with Chameleon Concessions, the enterprising Minneapolis company that has built a significant number of Twin Cities food trucks, Ingram has fixed three eye-grabbing vintage vehicles into the restaurant’s footprint. A 1955 bus has been fashioned into a bar, and a trolley from the 1920s has been repurposed into the order counter (pictured, above). When spring arrives, a rare 1929 Dittmar bus will anchor the patio and offer a splash of nostalgic character to an otherwise banal streetscape. This is all a roundabout way of saying that Ingram has a knack for creating appealing dining environments (another example: the food court he’s built on the street level of Target Center, which turns cargo shipping containers into stationary food trucks). But can he make a good burger? Yes. At Bus Stop, there are nine on the menu, including versions that showcase salmon, chicken and a vegan patty created by the Herbivorous Butcher. The beef burger does double duty, because it makes frequent nods to the beer that will soon be brewed on the premises. (The equipment is scheduled for delivery on Jan. 12). ‘“If beer is a component of who and what we are, beer should live and breathe in our food,” said Ingram. It begins with the cheese. Done. It’s a lavish gesture: Cheddar is cleverly fortified with fresh cheese curds (from Ellsworth Cooperative Creamery in Ellsworth, Wis.) for creaminess, and a light lager (brewed by Third Street Brewhouse in Cold Spring, Minn.) contributes a hint of tanginess without overwhelming the Cheddar’s bite. Even better, it’s a pile-on, way beyond the usual slice or two. Beer also plays a role, albeit a minor one, in the beef. The thick, juicy patty – it arrives with a lightly pink center -- is fashioned from fat-rich ground chuck. The seasoning blend includes Cascade hops and dehydrated beer, which insert a barely discernible floral note, one that’s balanced by granulated garlic, salt and pepper. Garnishes are basic: shredded iceberg and a so-so tomato slice. 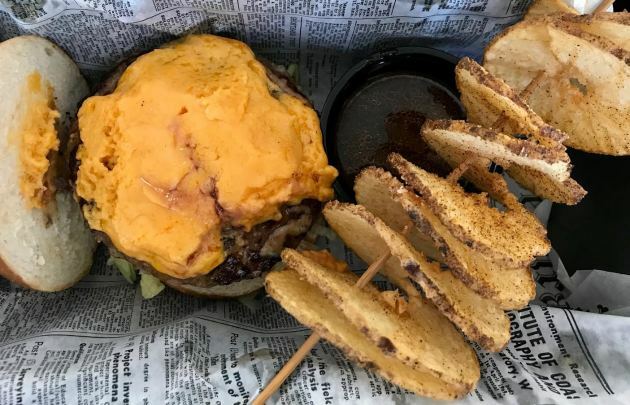 The burger is also served with a side of beef demi-glace (“I like dips,” said Ingram) but the weak-tasting, sodium-heavy results could benefit from some tweaks. The bun is a well-tailored wrapper for that juiced-up, cheese-laden patty. That’s when he contacted Milwaukee Pretzel Co. Co-owners Katie and Matt Wessel came up with a solution that offers pretzel bun heftiness – and that trademark scored top -- minus the over-the-top chewiness. It works. I’m looking forward to the debut of the brewery side of Bus Stop, because this is a burger that’s crying out for an icy-cold beer. Until then, the bar taps a selection of local favorites (Excelsior Brewing Co., Lift Bridge Brewing Co., Third Street Brewhouse) along with a number of quick-serve cocktails. Fries: Included, and nontraditional. “I’ve done skinny, crinkle, steak cut, everything,” said Ingram. “There are a million burger guys out there, so how do we find our niche in this crowded marketplace?” The solution came from his kids. When they hit the summer fair circuit, they enjoy spiral-cut, on-a-stick fried potatoes. Bingo. The results are a fun novelty, with the skin-on, thin-sliced, well-seasoned potatoes retaining their soft, starchy texture. Address book: 620 S. 4th St., Mpls., 612-886-1003. Open 11 a.m. to 9 p.m. Sunday through Thursday, 11 a.m. to midnight Friday and Saturday.